Recorded music makes standards a funny thing. Songs themselves don't really need to stand the test of time anymore -- until we reach that point of technological no return like Zion in The Matrix, it's safe to assume that we can listen to any song we could ever want to hear forever and always. But folk music is the antithesis to that: these are songs that resonate so deeply that they've been sung across space and time. Even if their names are lost to us (or perhaps having a name attached to a song like that was simply not something that occurred to the songwriter), having a song "go viral" was probably a songwriter's goal back in the day. The point was to take a song that everyone knew and add your own spin to it. Now, writers don't necessarily write a song that's meant to be played by others. The whole point is to express that writer's individuality. So where does that leave the last 100 years of popular music? Will covers ever morph into standards? We're All Criminals Here seeks to bridge that gap. Without Uncle Tupelo there'd be no Adobe & Teardrops. Cornelius Chapel Records of Alabama has retooled its lineup and to celebrate they've brought four of alt-country's best bands (and four of this writer's favorite bands) together: Two Cow Garage; Empty Orchestra; Have Gun, Will Travel; and Drag the River. Each band puts their unique spin on these songs, but Farrahr and Tweedy didn't necessarily want these songs to belong to anyone else. 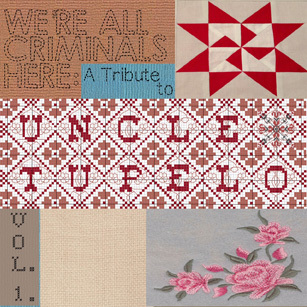 There's a tell-tale chord progression that always marks these songs as purely Uncle Tupelo. While they clearly have their own life beyond their creators, they bear a special stamp from some of the founders of some of the most powerful music this side of the Reagan administration.